Communal violence was mostly preceded by hate speeches by political leaders and Parliamentarians including ministers. The speeches served as a cue to the aggressive elements to resort to violence with impunity. North India has reported highest number of instances of communal violence in the year 2015. Some news reports went as far as calling the cow belt of India a tinderbox of communal violence. Some characteristics were discerned to have beset the violence all over northern India and particularly in Uttar Pradesh. Communal violence was mostly preceded by hate speeches by political leaders and Parliamentarians including ministers. The speeches served as a cue to the aggressive elements to resort to violence with impunity. Social media like facebook and whatsApp were used extensively to spread misinformation, rumors as in case of riots in Shamshabad. Most incidents of communal violence preceded elections, including panchayat elections in UP. Even a smallest incident could trigger off communal violence due to the polarization of the society. As said by a BJP activist in UP, “Hindus and Mohammedans can’t live together any longer” (The Hindu, 2015). Uttar Pradesh which is slated for State assembly elections in 2017, witnessed 68 instances of communal violence in the first half of 2015. Western UP was particularly on the boil. Agra was tense when Muslim youth cut electric wires of the market to clear the way for a procession on the occasion of Eid-eMilad-un- Nabi. Shopkeepers objected to cutting of wires and subsequently led to rioting and stone pelting (The Hindu, 2015). In Bareilly, a slaughtered animal was found outside a religious place in Sahukara Naugoan. The police registered an FIR against unidentified persons for defiling of a religious place. Local BJP leaders were booked for obstructing the police from doing their duty. Two companies of PAC were deployed to contain the violence. There were no reports of the number of dead or injured. (The Hindu, 2015). 17 persons were injured in Kandhla area of Shamli during the clash between Tablighi Jammat volunteers and Jat youth in a local train. The group of Jats allegedly attacked and beat up five members of the Tablighi Jamaat. The members of the minority community demanded arrests of the culprits in the case. (The Hindu, 2015). Violence erupted in Lucknow when Hindus and Muslims quarrelled over the use of loudspeakers by a temple at the time of azaan. Stone pelting was resorted to by the mob though no one was reportedly injured. The police also reported that both sides opened fire. The police arrived on the spot and diffused tension (The Hindu, 2015). Communal violence broke out in Muzafarnagar ironically marking the second anniversary of the Muzafarnagar riots that took place in 2013. The Bajrang Dal on 29th August attacked the vehicle of Nazeer Ahmad Qasmi, a popular cleric of Muzaffarnagar. Followed by this incident there were many rumors doing round in the area. The Muslims demanded the arrests of the activists of Bajrang Dal. In another incident, violence erupted in the Kutba village when the Muslim victims of the riots in 2013 came back to the village to collect bricks from their abandoned houses to build houses in the other villages they have settled in. These Muslims were attacked and beaten up by the Jats from the village. The agitated Muslim mob upon being returned by the police with no action taken to arrest the culprits, resorted to blocking the main road. This blockade led to clashes between the Muslim and Jat youth. The number of injured were not reported (The Hindu, 2015). In early September communal clash was witnessed in Shamshabad, 25 kms from Agra over an objectionable post on Facebook against Prophet Mohammad. The violence spread to other nearby villages. A mob enraged over the post vandalized four religious places. They forced shut shops and set fire to some structures. The vigilante mob caught hold of a shop owner, Mr. Gupta, who allegedly posted the objectionable post on Facebook. He was beaten up and the mob attempted to hang him. The police registered a case against the mob for disturbing law and order and another FIR was registered against Mr. Gupta for posting the objectionable comments. Over 100 people from both communities have been booked (The Hindu, 2015). The incident that shocked the nation and questioned the moral fiber of our society was the lynching of 58 years old Mohammad Aqlakh in Bisada, Dadri over rumors of consumption and storage of beef in his refrigerator. Prior to the lynching, a priest using a temple loudspeaker claimed that the Aqlakh family had consumed beef. Following this the mob rushed to lynch Mohammad Aqlakh resulting in his death and critically injuring his 21 year old son, Danish. The police instead of promptly arresting the culprits sent the meat in the refrigerator of Aqlakh to the forensic laboratory for checking if its beef (Times of India , 2015). Eventually BJP leader’s son was arrested in this case. The tension created by Dadri incident spilled over to two other adjacent villages of Chitehra and Kudakhedi. In Chitehra village, a head of a calf was found which led to rumor of cow slaughter and subsequent tension. Similarly in Kudakhedi a calf belonging to a farmer died of natural causes. However, trouble mongers spread rumours to give this incident a communal turn (The Hindu, 2015). Instances of communal violence during religious procession are very common as demonstrated in an incident in Fatehpur district of UP. Riot broke out when an idol procession was taken through a route different from the one permitted. On the changed route a Mosque was located. Stone pelting was resorted to by both the communities. Two houses were partially damaged and two bicycles and three motorcycles were set on fire. However no major injuries were reported. PAC and local force was deployed and the police claimed to have diffused the situation (The Indian Express, 2015). 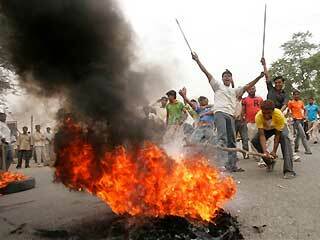 Riots broke out in Mainpuri in Agra when a mob nearly lynched four Muslims. The mob alleged that the four Muslims had slaughtered a cow and skinned it. The police however found that the cow was already dead when the owner handed it over to the four for skinning it in order to sell the skin in a tannery. The rioting mob set fire to more than a dozen shops belonging to Muslims. 7 cops were injured. The police filed two FIRs, one against the men charged with killing the cow and the second against 500 unidentified men for triggering riots when section 144 of CrPC was already in place anticipating trouble during the panchayat polls (Times of India, 2015). The police found that some right wing organizations have been at play in spreading hatred and planning the riot by mobilizing the mob (Times of India, 2015). A total of 30 arrests were made invoking stringent sections of IPC including 307 (attempt to murder), 148 (rioting, armed with deadly weapon), 353 (assault or criminal force to deter public servant from discharge of his duty), 436 (mischief by fire or explosive substance with intent to destroy house, etc). The police didn’t divulge the names of the right wing organizations (Times of India, 2015). What’s perhaps alarming is that Hindutva forces wedging a drift between Dalits and Muslims. A minor clash between two groups of youth over bursting of crackers occurred was portrayed as a “Dalit vs Muslim” clash by VHP and BJP. This incident occurred in Aligarh where Gaurav, a 22 year old dalit boy died due to the injuries sustained during the clash. VHP and BJP demanded that Gaurav’s family gets Rs. 40 lakhs as compensation as been given to the family of Mohammad Akhlaq (The Hindu, 2015). Bihar witnessed polls last year but the polls were preceded by heightened communal violence in order to polarize communities and consolidate vote banks. The issues raked up most for spreading violence were – throwing of animal carcasses in religious places, conflict over route of religious processions, desecration of idols and land disputes. After the split of the alliance in Bihar between BJP-JD(U) in 2013, the number of communal incidents have increased to 445 in the period of June 18, 2013 to June 30,2015 up from 92 between January 1, 2010 to June 18, 2013. A dispute over a kite which landed in a graveyard in Rohtas turned communal claiming one life and injuring 17. The background to this conflict was reported to be an altercation turned violent over a Muslim man reprimanding a Hindu boy over urinating outside his shop (The Indian Express, 2015). Azizpur communal clash was a major riot. The body of one Bhartendu Sahni of Bahilwara was found in the field of Wasi Ahmed in Azizpur. It was alleged that Bhartendu was in love with Wasi Ahmed’s daughter and his son enraged with this love affair killed Bhartendu and dumped his body in the field. The Sahni community upon discovering the body torched 40 houses of Muslims in Azizpur and killed five people. The villagers of Azizpur felt that the violence was result of Sahni community’s attempt to further marginalize Muslims of the village. The police has lodged a case against 2000 people and arrested 13 who have been named in the FIR (The Indian Express, 2015). In April, the Hindus and Muslims clashed over a piece of land considered holy by the Hindus but which is situated in middle of a graveyard orKabristan (Indian Express, 2015). So volatile and charged was a communal scene in Bihar that petty fight over a cricket match between two local teams in Gaya’s Chandauti village took a communal turn (The Indian Express, 2015). In November, communal violence erupted when a 19 year old Mohammad Rizwan lost control of the pick-up van while driving and rammed into the house of a 60 year old man in Vaishali. The man was killed along with his 8 month old granddaughter. When rumors spread that Rizwan has been let off by the police after preliminary inquiries, a mob clashed leading to death of a 17 year old Vikas Kumar after being critically injured in the police firing (The Indian Express, 2015). The violence in Haryana was aimed at consolidating the socio-political hegemony of the dominant Jat community and countering the seemingly assertive Muslim community in order to maintain status quo in a feudal society. A church was vandalized in Kaimri village, Hisar. The priest in Kaimri village was threatened by one Anil Godra. He alleged that the priest was trying to convert the villagers into Christianity. The Church was under construction and Anil Godra along with his accomplices allegedly pulled down the cross of Jesus and replaced it with an idol of Lord Hanuman. The Police registered an FIR against 14 persons (The Indian Express, 2015). The major instance of communal violence was in the village of Atali. The conflict between the Muslims and Jats in Atali was over construction of a Mosque. The land where a makeshift Mosque existed and Muslims from the village prayed for many decades was claimed by the Jats in the village as property of the Panchayat and objected to the building of the Mosque. However the district court had ruled in favour of the construction of Mosque. There were two bouts of violence which claimed one life and injured 19. The police’s delay and hesitation to arrest the accused named in the FIR emboldened the Jat youth to mount the second attack in July preceded by the first attack in May. In the aftermath of the riot the immediate concern was the social boycott imposed by the powerful Jats on the minority Muslims. The spillover of the Atali violence could be seen in Tikri Brahman village in Palwal, only 30 kms away from Atali in July. Though the exact triggering point wasn’t spelled out in the report, it was reported that the altercation between two youth led to a riot in which 17 people were injured (Indian Express, 2015).